With autumn upon us, and winter rapidly approaching, most homeowners aren’t spending much time thinking about their lawn. But autumn, with its cooler temperatures and occasional rainfall is the perfect time to prepare your lawn for next spring. Continue to water and mow your lawn, as needed, throughout the fall. Then as the season draws to a close, drop the mower’s blade to its lowest setting for the last two cuttings of the year. That will allow more sunlight to reach the crown of the grass plant and there will be less leaf to turn brown during the winter. As you lower the blade, remember not to trim off more than one-third of the grass leaves at any one time. If necessary, gradually lower the cutting height until the time of the final two cuttings. Fall is also a great time to aerate your lawn so that oxygen, water, nutrients and fertilizer can easily reach the grass roots. 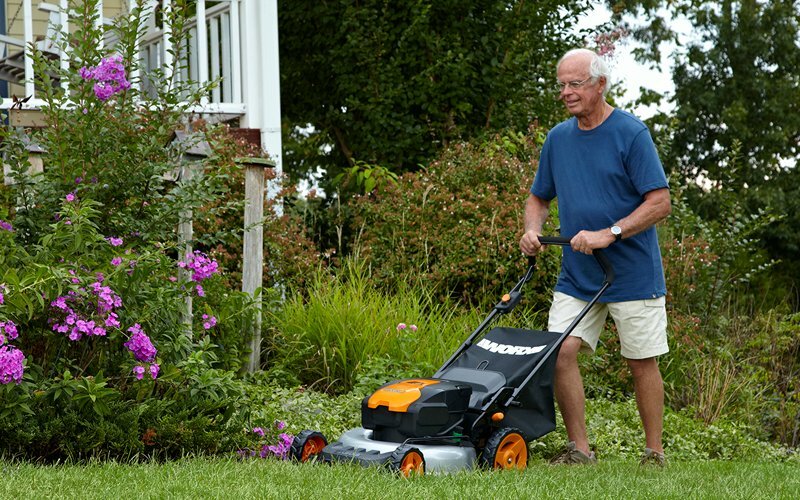 You can rent a gas-powered, walk-behind lawn aerator for about $70 per day. The self-propelled machine will quickly punch holes into the soil and extract plugs of dirt. If you’ve got a very large yard, say, more than three or four acres, and don’t feel like aerating it yourself, hire a landscape contractor. Raking leaves might not be much fun, but it’s important to remove fallen leaves from your lawn as soon as possible. Don’t wait until all the leaves have fallen from the trees to start raking. If you do, the leaves will become wet from rain and morning dew, stick together and form an impenetrable mat, which will eventually suffocate the grass and breed fungal diseases. An alternative to raking is to use a lawnmower fitted with a collection bag, a leaf blower, or a blower/vac that also mulches the leaves (as shown above). These methods are particularly effective if you have a very large yard with many deciduous trees. Regardless of which method or machine you use, be sure to remove the leaves before they turn into a soggy, suffocating mess. Most lawn experts agree, if you fertilize your lawn only once a year, do it in the fall. The reason? Grass leaves grow much more slowly as the weather turns cool, but the grass roots and rhizomes continue to grow strong. (Rhizomes are the horizontal plant stems that lie just beneath the soil’s surface; they produce the blades of grass above and the roots below.) A fall application of fertilizer delivers essential nutrients for the grass to grow deep roots now and to keep on reserve for a healthy start next spring. Wait until mid- to late-fall, then apply a dry lawn fertilizer to all grassy areas; be careful not to miss any spots. You can use a crank-style broadcast spreader, but for optimum coverage, consider using a walk-behind drop spreader. It takes a little longer, especially on hilly yards, but a drop spreader provides the best way to apply an even, consistent amount of fertilizer. Autumn is also an ideal time of year to repair and replant any bare, bald spots in your lawn. And the quickest, easiest way to do that is with an all-in-one lawn repair mixture. Sold at most garden shops and home centers, this ready-to-use mixture contains grass seed, a special quick-start lawn fertilizer and organic mulch. Use a garden rake to scratch-loose the soil at the bald spot in your lawn, then spread a thick layer of the lawn repair mixture over the area. Lightly compact the mixture, then water thoroughly, and continue to water every other day for two weeks. If broadleaf weeds, such as dandelions, have taken over your lawn, now’s the time to fight back. Weeds, like most plants, are in the energy-absorbing mode during the fall. They’re drinking in everything that comes their way, including weed killers. Apply an herbicide now and the weeds won’t return in the spring. Read the package label before use, but most herbicide manufacturers recommend applying weed killers during early- to mid-autumn when daytime temperatures are consistently at or above 60°F. For more information about innovative tools from WORX please visit www.worx.com.